On September 3rd, this body will have been on earth for 60 years. That's been a difficult thing to grasp for the past few months and I don't know why. I haven't felt any bumps along the way to aging, such as going in to the 40's and 50's, but there's something about 60 that just seems too much to comprehend. Maybe because my mind still thinks I'm an adventuresome teenager ... and on my good days when the disease (rheumatoid arthritis) isn't controlling the day, I act like a teenager at times. Maybe it's the disease that makes me think age is now relative to my existence on earth ... or maybe it's that I've always thought I'd be able to do what I wanted on any day. Well ... regardless, age 60 is going to happen, and possibly before this body is totally healed. Yes, I still believe in healing and believe there will be a day in time when my health will be fully restored. That's because Jesus healed all the time while he was on Earth, and He's the same today, yesterday and forever more. It's just a matter of digging into the Word and being obedient to God's commands and working through the illumination that the Holy Spirit gives. It's also about letting God be God in my life and trusting in His timing for all things. Psalm 103:2-5 has been a favorite for the past few years: "Praise the LORD, O my soul,and forget not all his benefits - who forgives all your sins and heals all your diseases, who redeems your life from the pit and crowns you with love and compassion, who satisfies your desires with good things so that your youth is renewed like the eagle's." In the meantime, to get my focus off the number 60, I decided I was going to find 60 experiences that I've never had. That can mean new species that I've never seen and photographed (which was my #1 experience), or a place I've never been, or whatever is a new event for my life. It may take me the entire year to do it, but it's a great change of focus for the number 60. And I made the switch immediately, so I'm working on it before I become 60. So, I'll be sharing those experiences with you, my sweet friends, but I also want to encourage anybody who has a problem with aging and/or living life with a dreadful disease, to keep the excitement in your life! Look for new blessings daily and focus on the things that aren't obvious, not the circumstances of what you can see. It really makes a difference with how the days end ... and begin again the next day. Our thoughts produce hormones, good or bad, and those hormones can take away pain. Getting the fear out and the faith in is essential to living life well, whether you're sick or healthy. #1 of 60 - I've been watching the butterflies more closely since I decided to seek new species and this was a new one that arrived on our deck on July 22. I first titled this as a Juvenal's Duskywing Butterfly, but later found out it is a female Horace's Duskywing. So similar, but the real clue was in the time of its arrival. It was too late for the Juvenal's Duskywing. The host plants for this butterfly, where the female lays its eggs and the caterpillars feed, are red and white oaks. The forest behind us is certainly full of oaks, but I have never noticed this butterfly before. I suppose the less colorful butterflies don't attract our attention as much, although the pattern on this butterfly is certainly beautiful. 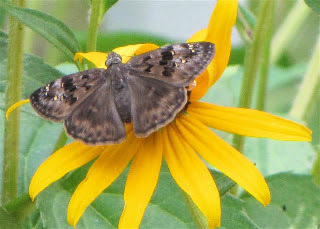 #2 of 60 - Nine days later, on July 31, I photographed another butterfly and after getting an official ID on it, discovered it was a Male Horace's Duskywing Butterfly. Gee whiz! Guess this guy also thought the female duskywing was very beautiful. The female will deposit the eggs on new growth of a host plant so the caterpillars have young leaves to feed on. They won't be turning into butterflies this year though ... they will hibernate over the winter to come forth and enjoy our habitat's blooms next year. They obviously enjoy the Black-eyed Susans on our deck. The adults (butterflies) also feed on Goldenrod, which we have plenty of in our habitat. How exciting to be able to know some of the things going on in the trees of the forest. It's amazing how many 'wild things' have been attracted to our deck garden. #3 of 60 - On August 2nd I discovered the bird bath had a bunch of seeds in it ... but it wasn't near anything for seeds to fall into it. 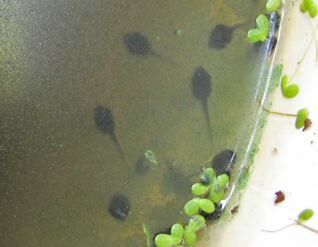 I put my fingers in to inspect them and realized they were tadpoles because some of the "gel" that they are laid within was still intact. This is their first meal when they "hatch." 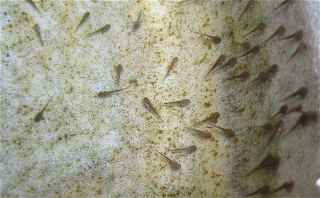 A few days later I took this photograph from which I could now tell for certain they were tadpoles with a macro shot on the camera setting. They were moving about eating the algae from the bird bath, which I purposely did not clean after finding the eggs, since that's their main source of food to grow on. We have a small pond not far out from the deck, but it's got a few mature resident Green Frogs ... who love tadpoles for snacks. I assume they are Eastern Gray Tree Frog (Hyla versicolor) tadpoles because we have a male (only the males sing) who spends months on our deck singing away for a female every year. We enjoy this greatly even though they are like the Carolina Wrens of the frog world. Small frog, big voice. This was a first for the female to actually lay eggs on the deck. And it's certainly a first for me to raise tadpoles to frogs. I made a "bucket pond" for the tadpoles to grow in and I'm hoping it's not too late in the season for them to complete the process which takes from 45 to 65 days. Randal now calls me Mama Tad since I check on the tadpoles morning and night and feed them capsules of Spirulina. They're getting fatter all the time, but are still in the stage of eating vegetation rather than meat sources. More details on this story. #4 of 60 - One of our deck pots that we planted the Bell Peppers in had a plant I'd not seen before, so I decided to let it grow to see if it was something beneficial. When a plant blooms, it's much easier to identify it since most of my books show plants while flowering, or are totally organized by the color of the flower. That doesn't mean I get to identify everything I try for, but it does make it easier if the plant blooms. 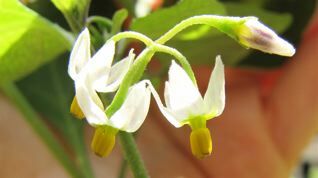 On August 6th, I discovered we had a Black Nightshade plant that would produce berries for the birds. How exciting! The funny thing is that Bell Peppers are also of the nightshade family. Since I planted the peppers in the biodegradable containers they were purchased in, the plant couldn't have come with the pepper since it wasn't rooted within the boundary of the container. I delight in any plants that feed the birds, but Black Nightshade can be a noxious weed since it produces a multitude of tiny seeds that will take over an area, besides spreading by root too. So, I won't place this one in the ground, but I'll let it grow on the deck to see how many berries it actually produces and how eager the birds are to have them. Various berries provide varying amounts of nutrition for a bird, so it's interesting to see how they will rate it. #5 of 60 - Butterflies have been abundant this year, so I'm excited to have found another new one, on August 7th, that I've never seen and photographed. 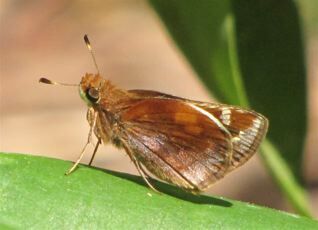 A female Zabulon Skipper Butterfly (Poanes zabulon). I thought she was very pretty with the fluffed up hairdo and colorful antennae ... and what about those big brown eyes? 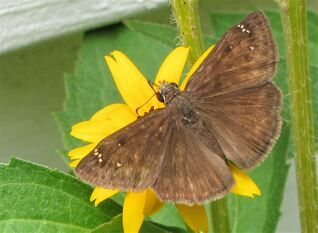 Skippers are named for their erratic, rapid flight. They differ a bit from most butterflies since they have larger bodies, smaller wings and "clubs" on their antennae. They are one of the most difficult to identify, so I had to inquire of a local specialist on butterflies.